Hokitika is a township in the West Coast region of New Zealand's South Island, 40 kilometres (25 mi) south of Greymouth, and close to the mouth of the Hokitika River. According to the 2013 census, the usually-resident population of the Hokitika urban area was 2,967, a decrease of 111 people since 2006. There are 876 people living in rural Hokitika, an increase of 48 people since the 2006 Census. On a clear day Aoraki / Mount Cook can clearly be seen from Hokitika's main street. Founded on gold mining in 1864, it was a centre of the West Coast Gold Rush. By late 1866, it was one of New Zealand's most populous centres. On 16 September 1867, there were 41 vessels alongside the wharf at Hokitika, in some places three and four deep. 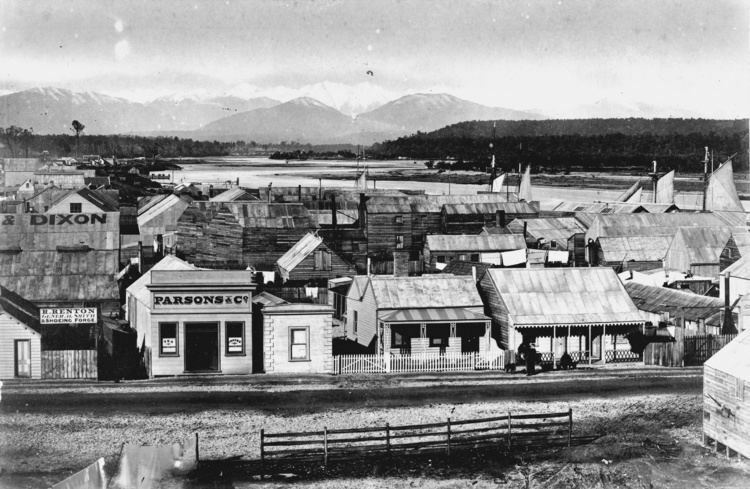 In 1867, the port of Hokitika ranked first in New Zealand in both the number of vessels entered inwards and in the total value of exports; principally gold. On 8 March 1868 a mock funeral was held in protest about the conviction and hanging of three Irish Fenian's in Manchester - the Manchester Martyrs. The funeral was led by Roman Catholic Father William Larkin and a Celtic Cross was erected in the cemetery. Larkin was later arrested, charged, and convicted of riot and seditious libel. In 1873 Hokitika became the capital of the short-lived Westland Province which lasted from 1873 until the abolition of provinces in 1876. In October 1941, three Hokitika police officers (and a policeman stationed in the neighboring locality of Kaniere), along with a field instructor for the Canterbury education board, were killed when a local farmer, Stanley Graham, went on a shooting rampage and killed seven people, including two armed Home guard personnel. In the ensuing manhunt, the biggest in New Zealand history, overseen by the Commissioner of Police, Denis Cummings, more than 100 New Zealand Police and several hundred New Zealand Army & Home Guard searched the area for the gunman for 12 days, with orders to shoot him on sight if found still armed. On 20 October, after being spotted by two police constables and a local civilian carrying his rifle and ammunition belts, Graham was fatally wounded by a police constable and died the next day. The population has declined greatly since that time but the population of the Westland District is now on the rise thanks to "lifestyle inhabitants". Almost 30% of the district's rate-payers live outside of Hokitika. Eleanor Catton's Man Booker Prize-winning novel The Luminaries is set in gold rush-era Hokitika. The major industries of greenstone (pounamu), gold, coal, and forestry have all dwindled over the last century, but a growing ecotourism industry has grown up and the town is starting to show signs of recovery. It has become a major tourist stop on the West Coast's main highway route, with carving of greenstone an important local industry. It is also gaining a reputation for its annual wild food festival which has been running since 1990. Seaview Asylum was once the town's biggest employer. Another important industry is dairying, with Westland Milk Products being based in the town. A co-operative that has been producing dairy products for many years, Westland is increasing its production at about 10% annually, and in recent years has installed plants to produce new products such as different types of proteins, AMF and others. The vast majority of its production is exported. The Hokitika Sock Machine Museum in town has on display a collection of antique sock-knitting machines and invites visitors to knit their own socks. Hokitika now boasts one of South Island's best 3D digital cinemas, the Regent Theatre, due to volunteer hours and grants from the Westland development trust, Lions foundation, Lottery's commission, the Major District Initiative and pub charity. The Art Deco theatre narrowly avoided being demolished, thanks to a last-minute coup in the management committee. State Highway 6 passes through the town. Air New Zealand Link provides two flights a day to Christchurch operated by Air Nelson. The Hokitika Airport is adjacent to the town, immediately to the north-east in the suburb of Seaview. A branch line railway known as the Hokitika Branch runs to the town from Greymouth; it opened in 1893 and an extension to Ross was open from 1909 to 1980. Passengers to Hokitika were initially served by mixed trains that carried both goods and passengers, and in 1936, these services were augmented by a Leyland diesel railbus service that ran from Hokitika to Greymouth, Christchurch, and briefly Reefton. In the early 1940s, the Vulcan railcars were introduced and they provided a twice-daily service between Ross and Christchurch via Hokitika. The mixed trains continued to operate until 1967, and all passenger services to Hokitika ceased when the Vulcan railcars stopped running past Greymouth in 1972. Since then, the line to Hokitika has been freight-only with traffic primarily coming from Westland Milk Products. In 1865, after the discovery of gold in the area, the town became the official port of entry of the West Coast. A boom period ensued when Hokitika was second only to Auckland, with reports of over 40 ships in the harbour at one time, with more waiting offshore. It was a dangerous port, however, with 108 strandings and 32 ships lost from 1865 to 1867. The lack of nearby coal meant that the port declined rapidly along with the gold, though Hokitika remained an official entry port until the 1950s. Hokitika has a wet oceanic climate. It is one of the wettest places in New Zealand. A school was described as "recently opened" in Hokitika in 1875, and had nearly 350 students. The Hokitika District High School provided both primary and secondary education for the area for many years. Its name was changed in 1963 to Westland High School, which caters for years 7 to 13 and has a decile rating of 6 and a roll of 373. Hokitika School is a contributing primary (years 1–6) school with a decile rating of 4 and a roll of 170. St Mary's School is a full primary (years 1–8) school with a decile rating of 5 and a roll of 153. It is a state integrated Catholic school and is connected with St Mary's Catholic Church. All these schools are coeducational. Hokitika has one sister city. 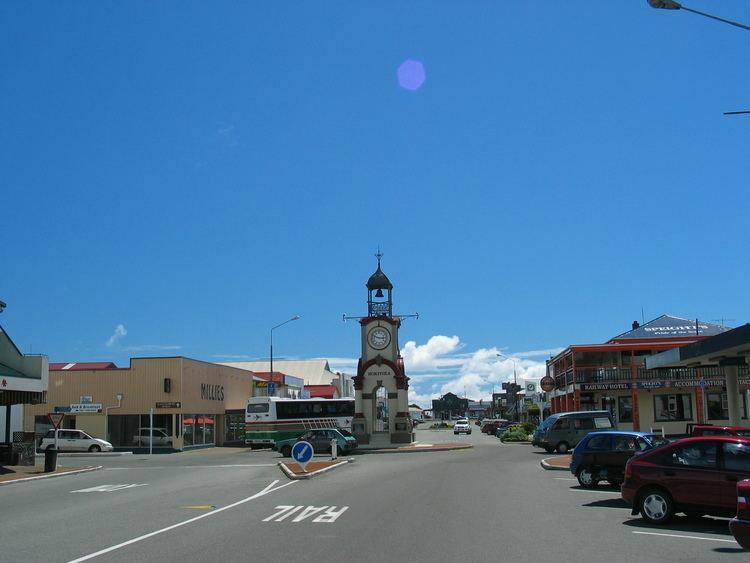 The events of The Luminaries, by Eleanor Catton, take place within Hokitika. The book won the Man Booker Prize in 2013.